Cartier is one of the many brands owned by Swiss luxury firm, Richemont. 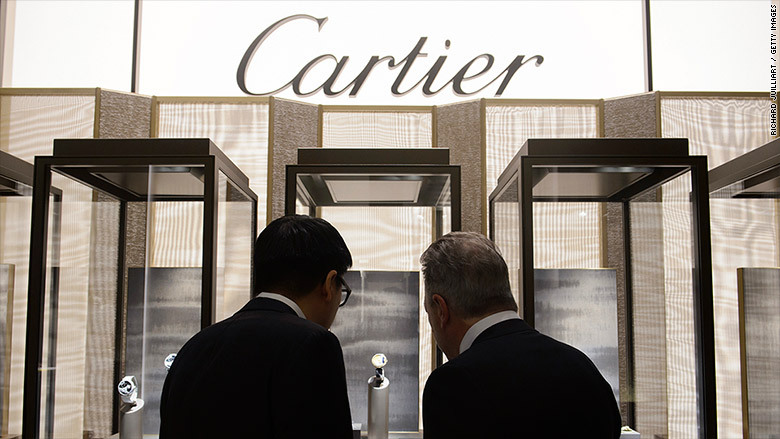 Richemont (CFRUY), the Swiss luxury firm that owns Cartier, Montblanc and more than a dozen other high-end brands, will get rid of the job next year, when its current CEO retires. Other senior leaders in the jewelry and watch conglomerate are also planning to retire, including the chief financial officer and eight directors on the board. Johann Rupert, the firm's founder and billionaire chairman, will stay on and may consolidate his power. Rupert has denied he'll take on more work and noted that younger executives will be elevated. "My role is really just here to smooth over the generation skip," he said on a call with investors and analysts on Friday. "Now it's time for us to start looking at another generation." He also praised the outgoing CEO, Richard Lepeu, a 38-year veteran of the firm. "I don't know how Richard did it," Rupert said. "I can't expect anybody to fulfil that role again, in that way." Richemont employs about 30,000 people. It also owns the brands Chloe and Van Cleef & Arpels. The shake-up was announced as the company reported a double-digit sales slump in the six months ending September 30. The results were better than expected, though, and investors bid up shares by as much as 10%. Luxury companies are struggling to maintain sales levels. Tourism has taken a hit in Europe after a series of high-profile terrorist attacks. And the strengthening yen in Japan has also dissuaded tourists there from making flashy purchases. A recent report from consulting firm Bain & Company predicts global spending on luxury goods will dip 1% this year to €249 billion ($276 billion). But brands that have captured the imagination of younger generations with fresh designs are beating the pack. Gucci, which is owned by Kering, recently reported a huge surge in sales as customers snapped up new designs by creative director Alessandro Michele. Richemont told investors it will strive to adapt and is confident in the "long term prospects for high quality products." "Everything is changing," Rupert said, "and we want to stay ahead of that curve."